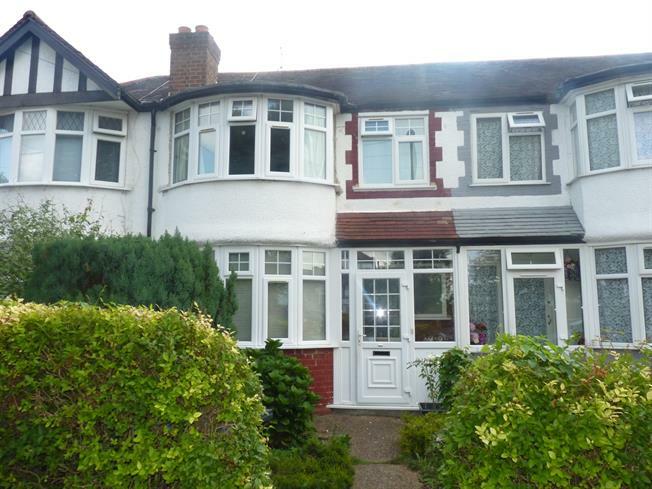 3 Bedroom Terraced House For Sale in Greenford for Offers in excess of £480,000. UPVC front double glazed door. Double glazed uPVC window facing the front. UPVC front double glazed door. Double glazed uPVC window with patterned glass facing the front. Radiator, carpeted flooring, under stair storage, painted plaster ceiling, original coving, ceiling light. Double glazed uPVC bay window facing the front. Radiator, carpeted flooring, painted plaster ceiling, original coving, ceiling light. UPVC patio double glazed door, opening onto the garden. Double glazed uPVC sash window facing the rear. Radiator, tiled and carpeted flooring, painted plaster ceiling, original coving, spotlights. Roll top work surface, fitted and wall and base units, belfast style sink and with mixer tap, integrated, gas oven, integrated, gas hob, over hob extractor, space for standard dishwasher, space for fridge/freezer. Laminate flooring, built-in storage cupboard and boiler, ceiling light. Wood and roll edge work surfaces, built-in units, space for washing machine, dryer. Built-in storage cupboard, picture rail, painted plaster ceiling, ceiling light. Double bedroom; double glazed uPVC bay window facing the front. Radiator, laminate flooring, painted plaster ceiling, ceiling light. Double bedroom; double glazed uPVC sash window facing the rear. Radiator, laminate flooring, a built-in wardrobe, painted plaster ceiling, ceiling light. Single bedroom; double glazed uPVC sash window facing the front. Radiator, laminate flooring, picture rail, painted plaster ceiling, ceiling light. Double glazed uPVC sash window with frosted glass facing the rear. Radiator, tiled flooring, dado rail, painted plaster ceiling, spotlights. Low level WC, roll top bath with mixer tap, shower over bath, vanity unit and wash hand basin with mixer tap.